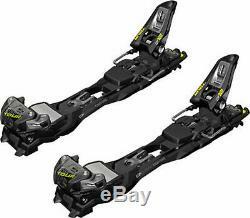 Marker F12 TOUR EPF S 265-325, Ski Bindings. 110mm Brake Blk/Antracite 2018 NEW. For touring oriented skiers who value a strong, reliable binding on descents that can still log a few days at the resort, it's tough to beat the Marker Tour F12 EPF Small Alpine Touring Ski Bindings. Impressively lightweight for a frame style binding, thanks to Hollow Tech and the Hollow Linkage Heel, the Tour F12 manages to remain surprisingly nimble on more strenuous ascensions. With downhill performance in mind, Marker integrated its Extended Power Frame (EPF) technology to improve power transmission on wider skis. Go effortlessly from in-bounds to the backcountry with the Marker Tour F12 EPF Small Alpine Touring Ski Bindings. If you have any questions, please let us know and we will return your message promptly. Thank you for shopping with Glacier Ski Shop! The item "Marker F12 TOUR EPF S 265-325, Ski Bindings 110mm Brake, Blk/Antracite 2018 NEW" is in sale since Thursday, March 14, 2019. This item is in the category "Sporting Goods\Winter Sports\Downhill Skiing\Bindings". The seller is "glacierskishop" and is located in Deming, Washington.